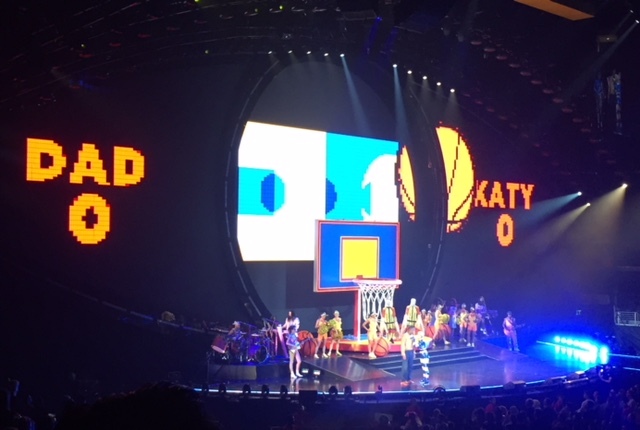 For two solid hours, last night (Wednesday, November 8th) the Pop Queen Katy Perry had the entire crowd at LA’s 8,000-capacity venue Staples Center truly engaged and mesmerized with her brand of fun pop tunes. There was no shortage of things to look at on her colorful stage. It’s hard to believe that she had already done this show the night before and has one more to go on Friday. 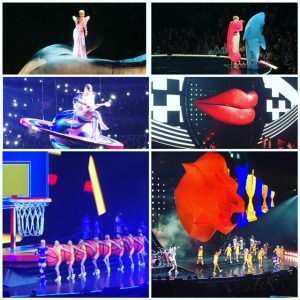 Called WITNESS: The Tour, these shows celebrate Perry’s newest Capitol Records album, “Witness” which was released this summer on June 9th. Each ticket purchase for this tour includes a copy of the new album. Katy is also partnering with Boys & Girls Clubs of America in a variety of ways on the tour and $1 per every ticket sold will be donated to the organization. The North American part of this tour kicked off on September 7th and will wrap up on February 5th in Canada. Visit http://katyperry.com for full tour dates. On this collection, Katy reflects on the changes in her own life and in the world around her, delivering songs that both challenge and inspire. Katy wrote each of the album’s 15 soul-baring songs, working with a variety of collaborators. 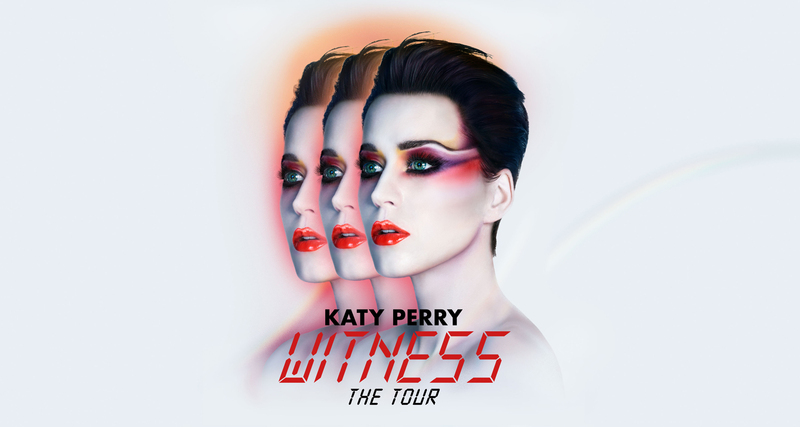 “Witness” includes the Platinum-certified hit “Chained to the Rhythm” featuring Skip Marley, “Swish Swish” featuring Nicki Minaj and the single, “Bon Appétit” featuring Migos. Katy and longtime collaborator Max Martin served as Executive Producers of “Witness” and Martin produced many of the tracks. In her 10 years with Capitol Records, she has racked up a cumulative 18+ billion streams alongside worldwide sales of more than 40+ million adjusted albums and 125+ million tracks. From start to finish, Perry’s solar system-themed concert was literally out of this world! Her elaborate eye-popping stage props, lively dance routines, acrobatic stunts, shooting confetti and pyrotechnics were beyond entertaining. She performed all of her greatest hits from each of her albums; “One Of The Boys” (2008), “Teenage Dream” (2010), “Prism” (2013) and of course “Witness” (2017). 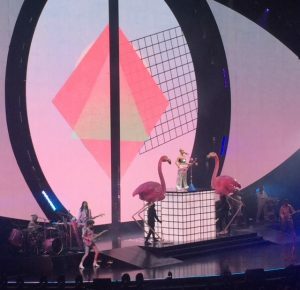 “This is my home and all my friends and family are here so you gotta know, it’s gonna be one hell of a show,” Katy Perry exclaimed at the top of the show. She was certainly correct about this hometown concert and did not disappoint her KatyCats as she lovingly calls her devoted fans. For every song, there was something completely new and exciting introduced to the stage that had the crowd reaching for their phones to capture. It would be impossible to list everything that was seen. However, a few of the highlights included two large die that dancers moved inside of and around, performers up on stilts dressed like businessmen with large TVs as heads and later on, those stilt performers returned but dressed as giant bubblegum-pink flamingos. 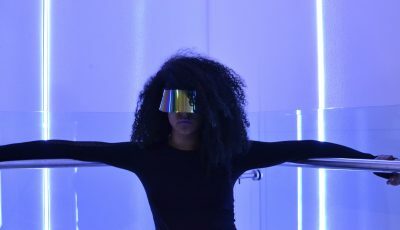 Her group of talented dancers changed clothes just about every song and wore elaborate costumes that fit the tone of each song. Katy’s outfits were just as fun and outlandish. Notably, for “Hot N Cold,” she wore a strapless top that revealed the lyrics lit up on it. Perry spent quite a bit of time up in the air at this venue. At one point, during “Teenage Dream,” she and her brightly dressed dancers were suspended on a yellow beam and did a synchronized dance while up there. Later on, for “I Kissed A Girl,” a giant set of red lips appeared on stage and Perry was lifted up high through the lips as if swallowed whole by them. This writer was particularly impressed during Perry’s stripped down rendition of “Thinking Of You.” While she strummed the guitar, she was moved around the venue on a rotating Saturn. It gave the opportunity for people sitting in higher sections to get a better look and picture of the singer. More highlights of the night included a moment when Katy stopped the whole show to make a live call to her mother. She did this after telling all the kids in the audience not to ignore their parents’ calls or texts. Who could forget when the crowd got very loud when the infamous Left Shark joined Katy on stage, who was first made popular during Perry’s 2015 Super Bowl halftime performance (most-watched Super Bowl halftime show ever). Perry got everyone on their feet when she performed a medley of her mega hits “Last Friday Night (TGIF)” and “California Gurls.” Other songs heard were “Chained To The Rhythm,” “Dark Horse,” “Deja Vu,” “Tsunami,” ‘”E.T,” “Bon Appetit,” “Roar” and many others. For her one-song encore of “Firework,” Katy stood in the palm of what appeared to be a giant statue’s hand. With a giant spotlight on her, it was the perfect powerful ending to an exciting trip of her music that she has just taken the audience on. 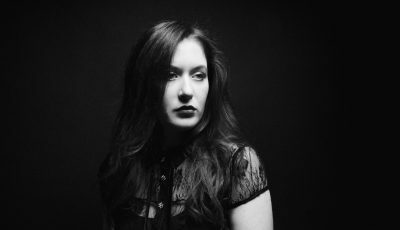 An Interview With Brazilian American Singer ALEXIA BOMTEMPO On Her Latest and Third Collection, Favorite Artists And More!